edit: finde ich nun viel viel besser! rauf auf die verdiente 5*! Seit eine bei "The Voice Of Switzerland" den Song sang, jetzt auch hier in den iTunes Charts. Denke dass es reichen wird um den Sprung in die Top 75 zu schaffen. Mag es ihr gönnen, sie ist eine grossartige Musikerin! Thought she would fade into oblivion after Love Song, well I was wrong. Many people brought it probably because of its very similar sound to Katy Perry's brilliant track Roar. Apparently there is no drama between herself and Katy Perry over the similarities. In fact, she said; "I mean, I can't say that I think that they don't sound similar. I've known Katy a really long time and we're friends. And at the end of the day, it was really only good for my song. So, thank you, Katy Perry for that!" Yeah I checked, and this was made before "Roar", despite it experiencing chart success later. In comparing the two songs, this is significantly better than that other piece of trash. There's the old phrase that bravery is synonymous with stupidity. I disagree though. For example, if you were to say The Beatles, Nirvana, Ke$ha, Queen, The Smiths, Justin Bieber, Nicki Minaj, Arcade Fire, The Velvet Underground, One Direction, Beyonce, Radiohead, Bob Dylan, Rihanna, The Doors, Soulja Boy, Pink Floyd, Bruce Springsteen, Madonna, Bon Jovi, Eminem, Macklemore, Kendrick Lamar, Kanye West, 50 Cent, Lil Wayne, Jay-Z, Nas, OutKast, or whoever the next artist popular among really no particular circle is overrated/awful/whatever with no real attempt at justifying and making yourself seem perfectly rational, you're certainly not being brave. Regurgitating something that's already been said by thousands upon thousands of people with the impression that it makes you seem edgy, nothing brave about that, but certainly plenty stupid. Anyway, I don't have any negativity to add to the picture as I enjoy this tune. I'm still convinced that every song that seems to use this same sort of staccato percussion line (ie the one in the verses) is directly or indirectly influenced by Grizzly Bear's "Two Weeks". There's actually something eerie of having followed music for long enough to see that song rise to prominence and now having its impact splash out into areas that surely could never have been comprehended. Still it works here, and gives it just a little more punch (though the surprisingly raw hip-hop beat kicks it off well too). All up it's quite uplifting and never gets boring for me. 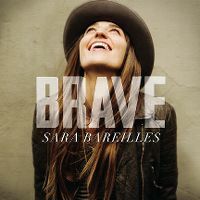 Sara does well particularly with the chorus, and once again managing to offer something pleasant that stands out in the charts, just like 5-6 years ago. Bravo to "Brave"! I just can't seem to warm to anything by her since the lovely 'Love Song' and it didn't help we only just got past Katy Perry's 'Roar' when this started getting significant exposure. I personally like 'Roar' a lot more and I hate the video for this! Ich muss zugeben: Sara Bareilles als Person ist eine coole Socke. Sie ist eine starke Frau, eine Teilzeitfeministin, wie sie selber sagt und sie hat eine tolle Stimme. in den USA hat sie 2008 mit LOVE SONG ihren Durchbruch mit LOVE SONG gehabt, ein Song der so unglaublich NON-MAINSTREAM klingt und dennoch so erfolgreich war. Dennoch muss ich gestehen, dass ich erst 2014 diesen Song hier angefangen hab zu mögen und mir als Digital Download gekauft. Der Song klingt wie ROAR und war wohl auch ein Prototyp dieses Songs. KATY PERRY ist eng mit ihr befreundet ! und sie hat sich wohl ihre Inspiration bei B geholt.